Syrian refugees now make up 20 percent of the kingdom’s population, Fakhoury said. However, only about 630,000 Syrians are registered with the U.N. refugee agency, he told reporters in Amman April 30. “About four months ago, the U.N. refugee agency stopped issuing me and my family of five food coupons,” said Samira, a Syrian refugee from the southern town of Daraa. Sitting cross-legged on foam cushions lining a floor where her family sleeps and eats, Samira told CNS that she has been trying to scrape together some living expenses from part-time work as a cleaner in Amman. Samira, who only gave her first name for fear of retribution to family still in Syria, is also suffering from a painful kidney stone, but she has been unable to go to a doctor because the $60 treatment cost is prohibitive. “In the past, Syrians got free medical help, but that is no longer the case,” she said, her dark eyes full of concern because, she said, one of her sons is suffering from a far more serious medical problem. Although some 80 percent Syrian refugees live outside U.N. camps and in Jordanian communities, more are moving into the camps. There, they no longer have to pay rent, and they have access to some free medical services. Still, others have gone back to war-ravaged Syria, despite the enormous danger as a result of ongoing fighting. 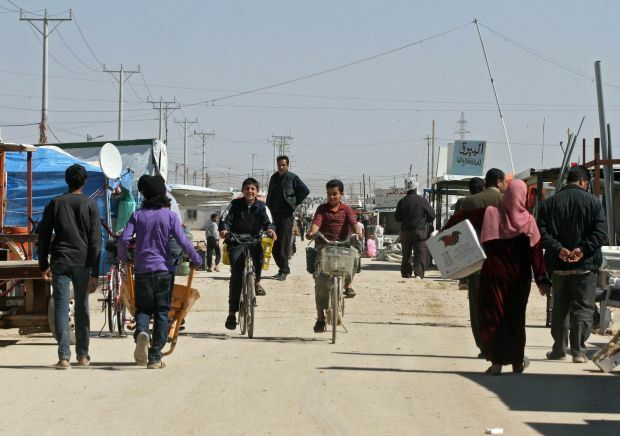 That said, there are still dozens of Syrian refugees streaming into Jordan weekly. Jordan, a resource-poor Middle Eastern country, has never been fully compensated for its assistance to refugees from all of the region’s conflicts over many decades, Fakhoury told CNS. Last year, only 37 percent of the $2.3 billion requested for humanitarian assistance in Jordan was received, and that’s been one of the highest percentages ever received. Jordan’s Information Minister Mohammed al-Momani said his country’s economy and security have been negatively impacted by the protracted conflict in Syria. Jordan’s military also bears the sole responsibility of protecting the 235-mile border between the two countries, he told reporters. “The lack of a political solution to the Syrian crisis has a cost and will continue to increase until there is a political solution,” said Edward Kallon, the U.N. resident humanitarian coordinator in Jordan. “The Syrian crisis is a global security threat and provides the highest caseload of refugees worldwide,” Kallon added. Jordan is one of five host countries for nearly 4 million Syrian war refugees.